Hammerworks 922P English Style Copper House Light is handcrafted exclusively in solid copper. If you prefer you can also choose from custom verdigris copper or painted black finish. In addition you can choose either the standard clear glass or optional seedy glass as shown here. No matter what these exquisite Colonial Copper Post Lanterns are handmade with attention to detail and exceptional quality. Most noteworthy the 922P shares similar characteristic with the English Street Post Lanterns 920P. Details such as the post mounting “frog” as well as the graceful candle cluster and intricate finial sets these Olde English Post Lights apart. As always you can choose to pair your English Style Copper House Light with any of our Cast Aluminum Lantern Poles. Thus the industry standard 3″ post fitter makes it possible to install it with the Aluminum Light Post of your choice. Most noteworthy if your landscape design scheme calls for various styles you will find everything you are looking for with us . Therefore you can choose English Manor House Wall Lights 922W to flank your entryways and garage doors. In addition we offer the English Manor Copper Hanging Lights 922H for those areas requiring overhead lighting. Due to the similar characteristicsEnglish Style Wall Light 920W is also an excellent choice to coordinate with our Reproduction Colonial Post Lanterns. For a completely different and unique look consider our collection of Olde English Tudor Lighting. 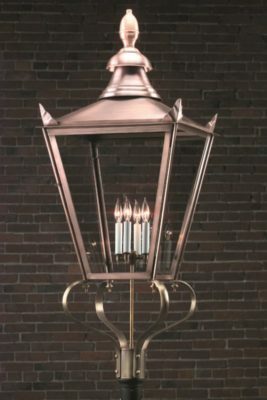 You will be impressed with the intricate details of Tudor Style Copper Post Lantern OWP1 and its’ companion styles. The hand hammered heavy gauge copper with individually applied rivets combine to create a singular look found only at Hammerworks. As always you will find everything you need within this extraordinary collection. Thus choose either English Tudor Copper Wall Lantern OWW1 or Tudor Style Copper Wall light OWW1A. In addition if you need overhead styles we offer both hanging and ceiling mounted options. The English Tudor Hanging Light Fixture OWH1 is available with both an open or closed bottom option. If ceiling height is an issue Tudor Style Ceiling Copper Light: OWC1 is the perfect option.